The Taster, by V. S. Alexander. Kensington Books. 336 pages. Trade paperback $15.95. Here is a totally gripping and credible imagining of how a young German woman was affected by the building chaos and cruelty during the late stages of Hitler’s rule. It gains its power through the very special perspective of its main character, who is also the narrator. In 1943, Magda Ritter leaves her parents’ endangered Berlin home seeking employment in a part of Germany less in the path of the war. Though she finds Hitler’s leadership abominable, she takes a position at his Berghof mountain retreat, and she mostly keeps her thoughts to herself. Her main job is to be a food taster, one of several protecting the despicable Führer from attempts on his life. Magda learns how to recognize poisons and how to control her fear of dying to save the beast. She makes friends and some enemies. In a place like this, dominated by true believers, its important to play along with the party line and not show your true thoughts or feelings. Indeed, your life depends on living a lie. Despite her caution, Magda will find some people who share her views and are alarmed at Hitler’s menacing actions which are taking Germany in a nightmarish direction. Most notably, she falls in love with Karl, an SS officer, who belongs to a growing cadre of conspirators against the Reich. At first, they keep their relationship secretive; later, they can be more open about it – especially when Hitler seems to sponsor their relationship and urges them to have many children for the Reich. Magda is befriended by Eva Braun, Hitler’s lady friend, which is a mixed blessing as the intelligent, attractive, and otherwise perceptive woman is clearly in thrall to the master deceiver. Nonetheless, Eva exhibits generosity and compassion – at least in Mr. Alexander’s version. Hitler stays on the move to make his location unpredictable. He travels among various retreats that serve as temporary headquarters. A large entourage travels with him, and the more and more indispensable Magda is among the group. Each of these places has a distinct personality. . . .
“Indispensable” is an overused term in book reviews, but Timothy Snyder’s analysis of the political, social, intellectual, and historical circumstances that gave rise to and even nourished Hitler’s brilliant madness is truly that. The parallels he draws between conditions in Europe in the 1930s and 1940s and those found today in many parts of the world—most notably in Africa—cannot be observed without the recognition that the breeding grounds for rationalized mass murder are still present in our world today. 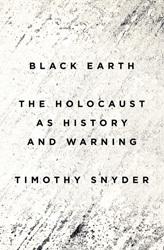 Snyder’s observations are based on the premise that statelessness is the prologue and necessary condition for genocide. Not only are stateless people the most vulnerable, but the territories they inhabit fall subject to structures in which established legal and political institutions no longer exist to protect its citizens—especially its minorities—and citizenship is no longer a stable reality. Hitler, with his conception of a “natural” order based on racial might and tested by warfare, used his military and political power to undermine surrounding states before herding Jews into those shadowy places. . . . Translated by Alan Bance, Jeremy Noakes, and Lesley Sharpe. Random House. 992 pages. Hardcover $40.00. Joseph Goebbels’ life was certainly history-making, but it’s a piece of history noted for its grotesque notions of nationalism, democracy, and leadership. For many years the Nazi regime’s Minister of Propaganda, Goebbels refined the art of mass psychological manipulation, over and over again rallying a despondent and pride-hungry people into becoming more and more the fervent worshippers of a mad genius and a mad vision of national and racial destiny. Peter Longerich, who first published this book in Germany in 2010, conceives of three major phases in his subject’s life. First, he portrays an insecure fellow whose compensatory delusions predict greatness of some sort. This young man needed large doses of positive feedback, beginning with mother love which eventually developed into an addiction to Führer love. His doctorate in German letters did not open doors for his aspirations as a literary and cultural shaper. Once Goebbels turned his attention to political action, he made the right moves to advance quickly through party ranks. The second phase concerns his activities as pre-war propaganda minister, hammering an imaginary political and cultural consensus into place through skillful manipulation of news and entertainment media and through staged demonstrations. He was adept at building Hitler’s image as a demi-god (demagogue?) and in building a strong personal relationship with his mentor and hero. Finally, he beat the drums for war, wartime sacrifices, and the ever-out-of-reach peace that would arrive with the continental dominance of a never-realized superstate. 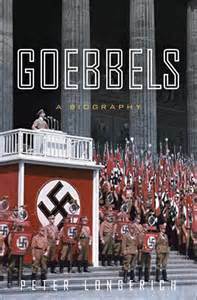 For all this, Longerich insists that Goebbels was not a true insider but was often surprised by actions set in motion by Hitler during meetings to which Goebbels was not invited. Of particular interest is Goebbels’ role in developing the political uses of anti-Semitism. Even as any remaining Jewish civil rights were demolished, even as mass executions began, even as Jews were fleeing or being relocated out of headquarters Berlin, Goebbels found ways of making the Jews responsible for all of Germany’s problems. It’s hard to say what he truly believed about Jews, so overwhelming was his commitment to using anti-Semitism as a political instrument. Longerich’s primary source is his subject’s diaries. Indeed, they are important historical documents that give unparalleled coverage of hundreds of events. They also provide unintentional clues to Goebbels’ anxieties and nonstop posturing. Longerich points out instance after instance in which narcissistic Goebbels interprets an event’s outcome to his advantage. In the author’s capable hands, we discover how the diaries reveal just what Goebbels would not want them to reveal. . . .